I thought I would design something that is worth putting cycling money into. The surrounding roads are single lanes anyway; https://maps.google.co.uk/maps?q=Roff+Avenue,+Bedford&hl=en&ll=52.142022,-0.473882&spn=0.00291,0.00685&sll=52.125874,-0.464687&sspn=0.019154,0.042958&oq=beford+roff&t=h&hnear=Roff+Ave,+Bedford,+United+Kingdom&z=18. The new design is based on what Mark shows in his video; https://www.youtube.com/watch?v=wEXD0guLQY0. I was minimal with the paint but it should be clear who has priority. The pedestrian crossing could possibly be moved closer to the roundabout to fit better to desire lines. Would this be something that CEoGB support? http://www.ctc.org.uk/sites/default/files/resize/media_library/users/Chris%20Peck/unionstreet-rbt-500x349.png. Raised tables seem to be a good idea. You're right, one thing I would change is to move the zebras closer to the tracks. "Zig-zags" are required officially on other side of zebra crossings, but you can get away with just two (a "zig" and a "zag") between the zebra and the track. This would make the crossing routes for pedestrians much more direct. But other than that it looks pretty good! Is there anything illegal about this design in the UK? I read the engineers/planners/poiliticians were saying the lack of an approved pedestrian and cycle priority crossing in the UK (toubra or zebcon if you will) makes it immmppoooossssiiiibbbllle to put a segregated track around this roundabout. Two zig-zags between the cycle crossing point and zebra definitely seems to solve this. Unfortunately, word from the DfT is that there can't even be trials of combined ped/cyclist crossings until the new TSRGD is out, whenever that may be...place your bets. A getaround is to put in a zebra, but place the give-way line on one side the maximum allowed 3.0m from the stripes. This creates space for the future (2015, 2016, 6120?) when Tigers should be allowed, and you can go back and fill the gap with 'elephants feet' markings to define he cycle crossing part. Previous comment deleted, thought better of it. I'm more and more minded that junction capacity assessments should make use of a microsimulation modeller like VISSIM. It takes more time to set up than an ARCADY, PICADY or LINSIG run, but actual driver behaviour can be modelled more accurately, e.g. gap seeking, random arrivals at the give-way line and speed around the roundabout. The problems with ARCADY, for example, are well known (add 0.1m to an entry width and get its RFC below 0.85 and the junction design suddenly 'works'). OK we need to get a bit real here. We do need to take through traffic off most of the road network, by blocking off rat runs and directing motors to more appropriate roads. We do need to challenge assumptions of ever increasing traffic growth, which lead to over engineered junctions - and vast potential for reallocation of effectively surplus road space. We do need to reclaim road space casually allocated for car parking. However, this does not mean we can simply wish away motor traffic and plonk a junction on a busy road with a capacity incapable of coping with the current volume. A low capacity single lane roundabout would obviously be better for cyclists than a busier junction, but if you actually succeded in persuading them to build such a thing the vast political outrage at causing traffic gridlock would ensure that the junction was put back the way it was within a matter of weeks. Now that doesn't mean nothing can be done. The key to the safety of Dutch roundabout design is that they design to minimise speeds where as the UK does the opposite. The turbo roundabout does keep the key features of a compact single lane roundabout - perpendicular rather than tangential approach and exit arms, tightly constrained and separated circlating lanes, single lane exits - that will keep motor traffic down to cycling speeds and make it possible to install zebra crossings for pedestrians. This design may not be your preffered design, but it will make a huge difference to safety (just as it did when they were installed in NL). And is most certainly not a sell out to traffic engineers; if that were the case there would already be thousands of them in the UK rather than this being the first example. Some of us have been campaigning for a long time for this sort of thing. You do make a good point about a backlash scenario. Has there been documented cases where a new juction design had to be reverted because its capacity was too low? I wonder how traffic would adapt. Perhaps how they adapt when there's road works; the Edinburgh tram works for example. My logic is that to reduce the number of cars on the road, you need to give those drivers a viable alternative. 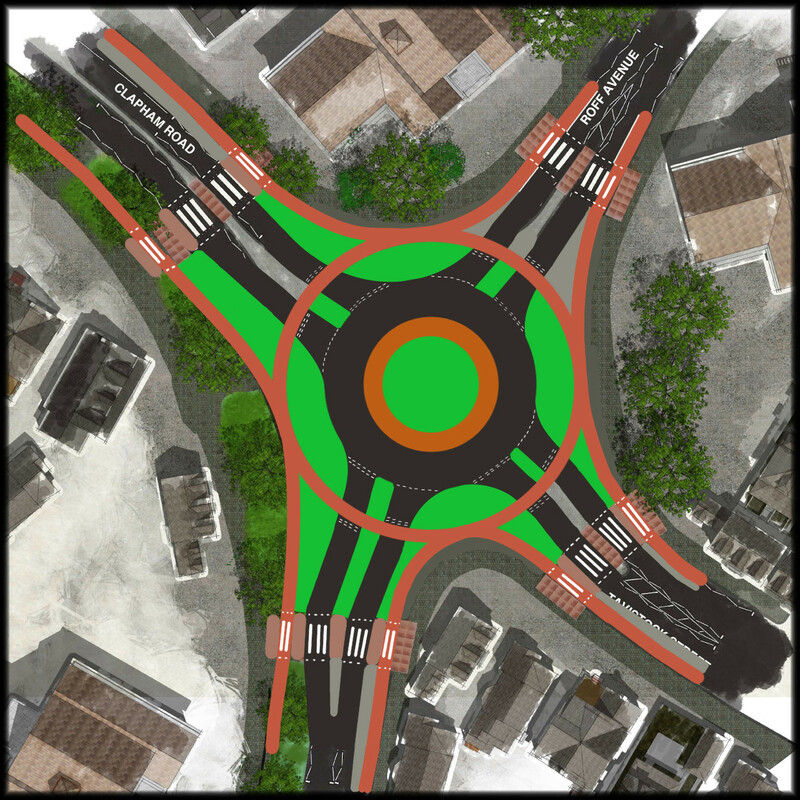 The "turbo" roundabout will only improve conditions for that 2% of the population willing to mix in with the cars, and for the pedestirans that will have zebra crossings. I'm not convinced this would change the status quo for car usage. There have certainly been cases in Warrington of junction changes (and being Warrington, obviously nothing to do with helping cyclists) where the result has been a marginal loss of capacity. As soon as more traffic arrives at a junction than it can handle queues start to pile up very quickly so if the capacity is only under by 1 car per minute that is a 60 car long queue by the end of the rush hour. This has caused outrage in the local press, emergency council meetings, calls for the sacking of the head of transport and funding miraculously found to re-engineer the junction in a very short time scale. It should be noted that the lane markings - although of little relevence for cycling - did actually improve conditions for just about everybody apart from drivers coming from one particular direction who had got used to approaching using incorrect lanes and were effectively locking up the roundabout for everybody else. The other troubling thing is these bike roundabouts will need to be supported by a cycle network. I don't know how much difference a bike roundabout would make on its own. I realise that there are not many of us - but I find it hard to comprehend people on this forum arguing that we should ignore the safety of cyclists because we are a only a small proportion of the traffic (that is the sort of stuff I expect from traffic engineers). As one of that 2% I have no desire to meet a premature end, so I consider a scheme such as this that make a huge improvent to the objective safety of roundabouts an extremely worthwhile excersise in its own right as a safety scheme - whether or not it actracts more cyclists. the new roundabout will be an improvment on the existing status because its is so bad. Especially since pedestrians now have priority to cross; I do wonder how that will affect car capacity. I think the disgreement is spending £300K on something that takes cycling infrastructure in the wrong direction. Do we have comparisons for what is safer, bike path roundabouts or riding in motor traffic? I don't think we'll ever get a fair comparison when riding in traffic for children, elderly and disabled is not an option. All the research I have seen points to cycle paths being very much less safe than that the carriageway at junctions, while improving safety on the links between them. I've not seen any direct comparisons for roundabouts though the problems are likely to be more severe since vehicles tend to exit roundabouts at higher speeds. It would be a useful excercise for the TRL study of the single lane continental roundabout to observe cyclists riding on the roundabout itself as well as those using the orbital cycle path. The roundabout comparison excercise would be interesting, I wonder if a fair comparison can be made. If you have to ride on the roundabout with cars, would it be difficult to have children, elderly and wheelchair/scooters included? These vulrable people wouldn't have the option of quickly speeding up to keep up with traffic. I wonder why the CROW standard was to choose priority for bike for urban roundabouts and vice versa for rural roundabouts even though priority to cars seems to suggest greater safety. I suspect that making cycle routes more convenient is a huge factor, stop-start journeys is a good way to stunt mass cycling and the asscoitated health benefits. A fair comparison would be straight-forward. I don't think the cycle facilities are intended for use by scooters or wheelchairs, but you could test for them in both situations as well if you really wanted. I don't get the obsession with "keeping up with the traffic". But, if you wanted to test the relative safety of the carriageway and cycle path at normal commuting speeds it would simply be a matter of asking the cyclists in the trial to ride a bit faster (both on and off road). If you want to test "keeping up with traffic" speed then you could provide them with electic bikes. However, you would need to be very cautious to gradually increase the speeds on the cycle path - the incident 2 minutes into the video could have been very nasty had she been riding faster. I share your concern about the near miss in the TRL roundabout, I wouldn't be surprised if that also happens in the Netherlands. My logic with "Keeping up with the (motorised) traffic" is that it improves vehicular cycling saftey. Once there is a speed difference, there is potential conflict. This is why its a bad thing for slow bike users and those who are not capable of the same acceleration cars can do. Good point about children going fast, I remember racing ahead as a child! I think what is important for them is something that is easy to use and subjectivly safe for them and their parents. I don't know if CROW explicily designs in for mobility devices in its cycle path design (I haven't brought a copy) but the Dutch do accept them as normal users of the cycle network. I think Mark's post on this explains it best; http://bicycledutch.wordpress.com/2012/12/06/who-else-benefits-from-the-dutch-cycling-infrastructure/ . It does show a brighter, less lonely future for the elderly compared to the UK. In practice, https://www.youtube.com/watch?v=wEXD0guLQY0, you can see some bicycle users go fast, some slow. I think that's the beauty of well implemented infrastructure, it suits all cyclists and other bike path users. TBH I'm questioning if the tools we use to assess junction capacity are still up to the job. The fundamental formulae used in ARCADY are, AFAIK, the same as given in Appendix 1 of TA23/81 of the DMRB (the same goes for PICADY and the formulae in Appendix 2 of that document). And for a TA, for example, it'll probably be ARCADY or PICADY (or LINSIG, or TRANSYT) which will be used to test if a junction is under capacity or what 'improvements' are needed to make it so. Creating a microsimulation model does take more time, and is thus more expensive, and therefore unlikely to be done unless specifically requested by the Highway Authority. if we accept the traffic volume as given the main problem with the design as it stands is that the crossing points are set so far back that it can't function like this one? Turbo roundabouts are most certainly NOT designed move cars fast; the entire intention is to improve safety by restricting car speeds. They do this for busier roundabouts in the same way that that compact roundabouts do for sinlgle lane roundabouts - by changing the geometry so that it is tight with perpendicular approach and exit arms and single lane exits. This means that drivers have to turn left onto the roundabout - follow a tight path to the right in the correct lane as they go round and then turn left to exit. On the other hand, UK roundabouts - such as the existing layout in Bedford - ARE most certainly designed to maximise speed - the flared tangential approach and exit arms combind with wide circulating lane mean that cars are barely deflected by the junction and can take a smooth swooping path through it. What is more it actually works - the before and after studies of the first couple of hundred roundabouts show a massive 70% reduction in KSIs (and that is an improvement on Dutch roundabouts that already were designed with safety rather than speed in mind so we should expoect an even greater improvement when UK roundabouts are converted). And before anyone points out that these roundabouts have orbital cycle paths - that is true - but it was true before they did the conversions so the measured improvement in safety is entirely down to the change in geometry. So reading a bit more: http://www.turbotrafficsolutions.nl/dissertatie/turborotonde_en_turbople... I understand that the safety aspect comes from reduced weaving of traffic lanes, and that efficiency comes from using the inner part of the roundabout more. Then like you say the reduction in speed against normal UK roundabouts definitely convices me that turbo roundabouts an improvement for cars. I hope that something other than solid white paint can reinforce the lanes' curvature, lest they are ignored. If Bedford don't put more than just white solid lines in place, ie kerbs, then cars will be tempted to cut across and go fast. The plan includes raised plasic lane dividers. These will act like longtitudinal speed bumps - so a strong incentive to keep in lane. They do need to be a bit traversable to let large vehicles overun them slightly - with geometry constrained enough to slow cars down to cycling speed it is going to be very tight for trucks. http://www.mnt.ee/failid/SlowTrRoundb.pdf seems to be by the Turbo Roundabout's developer. The picture at the bottom of page 5 of the Bedford background appears on page 10 of this paper, just above a table which links "Inner radius of circulatory roadway 12.00m" to "37-39 km/h". That's about 24mph, whereas Bedford is a slacker 15m radius if I've read it right. Is 24mph really "cycling speed" for many urban riders? Other interesting point in the PDF is that the lane dividers are at most 70mm tall, which is quite a bit less than the UK's 100mm maximum speed bump height and cars are expected to drive over those easily. 15m refers to the radius of the path of vehicles through the junction - particularly turning onto and off the roundabout - not the radius of the central island. The 12m in the table refers to the curve of the "lobes" of the lozenge shape in the middle. The two lobes are arcs of circles with centres 5.3m apart - the whole central island is then surrounded by a 4m wide apron. The vehicle lanes are beyond that. It has two lane entrances and exits and these are much less tight than the Bedford design - though you can see run-off areas on the exit corners that have been added to make it a bit tighter. The radius of the vehicle paths through the junction look to be in the order of 25-30m - which is enough to achieve significantly reduced speeds compared to a large conventional 2 lane rural roundabout - to about the speeds observed throught the existng geometry at Bedford. With the new Bedford design the whole central island has a radius of 12m - with small run-off areas cut within the island. The entire roundabout would just about fit within the line of the inner traffic lane of the Dutch example. The entrances and exits have tighter corners and these are the key constraints. I don't see how you're jumping from "Inner radius of circulatory roadway" to "the curve of the "lobes" of the lozenge shape". How is "the whole central island has a radius of 12m" not an "Inner radius of circulatory roadway" of 12m? Even if it's 12m (and I didn't spot that figure in the Bedford paperwork), motor vehicle speeds will be over 20mph, not a typical cycling speed through a complicated junction. If you look at the table and the footnotes below it you will see. 1. In column 5 (next to the 12m you spotted) - "Traversible Apron" 4m. Now look at the photos - Exhibits 8 and 9 and you can see the raised apron surrounding the central island and the shape of the losenge. A quick google earth search over South Holland came up with a typical example that shows those dimensions - see the link in the post above. There is no scale drawing on page 4. There's an overlay on an overhead photo of unknown distortion, which also shows a vehicle across the divider. Anyway, I suspect nothing we write now will stop this disaster, so all we can do is see what finally gets built (maybe Tiger crossings will be possibly by then), then sit back and await the traffic and casualty statistics. Oh, dear. You seem to be trying very very hard to dislike this. First - no it is not an engineering drawing, but it does have a scale bar and that is enough to tell at a glance that it is much tighter than the example from a Dutch dual carriageway and the radius does indeed refer to the turning circle of vehicles and not the radius of the centre island. If you think it is "distorted" you need to do better than suggest so by innuendo - you can check for yourself by checking overhead images on google earth. Second, "it shows a vehicle across the divider" - of couse it does - that vehicle is on the photo of existing roundabout. Actually, what people can do (at least those with a sufficiently open mind living in the area) is to go and ride the roundabout now, before the roadworks starts - and also to try crossing as a pedestrian. Then repeat the excercise with the new layout. I don't have to try to dislike it. That just happens. It's a further dual network disaster design, an even-worse version of what we suffer locally. It also exposed a governance problem within Cyclenation which I think we've reacted to, plus there are bigger dangers to cycling in Bedford where this money could have been better spent. I don't live that close to Bedford any more and I think it's a bit of a nuisance to take a bike to, but I may ride it if an opportunity presents itself. The acid test is whether it has any significant effect on cyclist numbers and casualties. In 1998, SWOV agreed with the recommendation of 'cyclists with priority' provided that the CROW recommendations for the layout of roundabouts were followed. SWOV also expected that roundabouts with such a layout would really be safer than those that deviate from the CROW recommendations. Unfortunately, in practice, many roundabouts do not conform to these recommendations. If they do, the safety benefit cannot be proven. But its right to be wary, especially if the UK popluation is not used to them. So it would be better to build the "turbo" roundabout, be honest that in cycling terms, it only makes it better for vehicular cyclist, and spend £300K on real bicycle infrastructure elsewhere. Hi - we've had a question on Twitter asking us what software you've been using to create these redesigns! Would be appreciated if you could let us know. Essentially for a resign, do you want to use vector based grapics or bit map graphics? Vector graphics allow high zoom and still have a sharp image, and has a typically smaller file size. Inkscape will inport/export .svg or .pdf. I think the dowside is it can get unweildy if you are not careful when making large area designs. Bitmap I think is more scalable for large layouts and is easier to work with on a relativlely low powered machine. I used it in my Leith Walk design since the consultation pdf was so huge it crashed Inkscape. There are probably ways around that. The downside is pixelisation and small details can be tricky. Using Layers is important as you can organise different parts of the street more easily. Perhaps I can do a tutorial post? Thanks, that's really helpful. I'll pass that on! I know Paul James (Pedestrianise London) uses GIMP too. A tutorial post would be amazing. Had a chat with the designer yesterday. Although he talks a lot about on road cycle use he is adamant that the new RBT will have periferal cycle tracks which connect in to the proposed zebra crossings set one car lengh back from the RBT. He is currently looking at the implications of the cycle zebra being proposed by DfT, problem being that as the new turbo has two lane entry, is this the right location to try this out for the first time in a UK town? I can see where he is coming from there, would myself prefer to see it operating on a couple of single approach RBT's first. If I were him I would probably stick with wide zebras to start with but leave sufficient room to burn off half the zebra and mark with the new design in a year or two's time. You might not agree with his assumption that bicycle use on the carriageway of a turbo is considered, but its much harder to fault what he is trying to do with the cycle tracks in the design (provided they are good ones). I was also at Cycle City and attended his talk. I didn't see his horns, and he was very genuine - he has to deal with a godawful roundabout as it currently exists, but it did seem that there was an element of using bike riders as mobile traffic calming. One small design detail comparing the UK version with the Dutch one shown was that in 'ours' there was a cut-out in the ICD, with a radius, basically as we'd provide spiralisation with road markings, which perhaps allows vehicles in (entry) lane 2 to start turning into lane 2 of the circulatory at a higher speed than the Dutch version, which appears to confront drivers in (entry) lane 2 with the kerb on the central island transvers to their path, and with a more defined 'slot' to fit in to. WRT the zebra/tiger issue. I believe a number of cities with CCAG funding are going this route, wide zebras now, with a reduction in width and elephant's feet when the new TSRGD goes live. Does that mean that the raised lane dividers are no longer part of the plan? If that is the case then much of the advantage will be lost. Yes, it looked like there were still the lane dividers. I was trying to explain the look of the layout; basically it has these sort of half-moon cut-outs of the centre island, which would appear to ease drivers onto the roundabout much more than the Dutch versions I'd seen, which seemed to have a definite lane into which you have to turn through 90 degrees. I wonder if this will have an effect on circulating speeds. But there are no typical Dutch junctions, and I've since seen versions which have a similar layout to the Bedford proposal. (Having said that, this page http://sustainabletransportationholland.org/examples/roundabouts-in-delft/n470-turbo-roundabout/ suggests there has been a change in the design of these things, with Bedford reflecting the older version, shown down the page, on the left). That is good to hear - I was worried that they might have abandonned the lane dividers because of the complaint by the motorcyclists. The Bedford layout is much smaller and with tighter geometry than most of the instalations in NL - which tend to be used on out-of-town dual carriageways with double lane entrances and exits. I think the half moon cut-outs you refer to are actually over-run areas for trucks - so they can actually make it round the turn rather than to ease the passage of cars. Most Dutch turbos have an entire lane for this purpose. In the Bedford case we are talking about single carriageway roads with single lane exit arms. The approach arms are only split into two at the last minute to lead traffic into the correct lane on the roundabout. The approach from Clapham Road is two lanes a long way ahead... and will drivers use the split into two as an opportunity to dive around pesky cycle riders, as happens at other spiral-laned roundabouts? Time will tell. I thought a link to David's blog post would be relevent here. These details mean that while cycle traffic doesn't have priority, in practice there is very little delay. They work well for people cycling. It's also worth nothing that until the late 1990s, all Dutch roundabouts worked this way, with no priority for bicycle traffic, anywhere! When priorities were 'switched', it was in urban areas only. It seems to have been sucessful at cutting traffic speeds (see p40) even without the lane dividers. Looking at the Crashmap website there does appear to have been one slight pedestrian casualty on Clapham Road (possibly in the vicinity of the zebra crossing) and two slight cyclist casualties, one near the Roff Street exit and the other on the Union Street exit - all in 2015 - after the data shown in the presentation, which all appears to be from 2014, the year of construction. Cycle only roundabout- Good Idea or not?